This entry was posted in News and tagged Asia, Canada, equity funds, Europe, fixed income, Latam, ranking, shares, USA on June 23, 2016 by Oscar Garcia. What stocks and funds were the best in May? T-Advisor publishes its ranking taking into account the score. T-Advisor patented score provides an asset rating (bullish, neutral or bearish) based on key performance indicators and technical analysis. This entry was posted in News and tagged Asia, Canada, equity funds, Europe, fixed income, fund, Latam, ranking, shares, USA on May 26, 2016 by Oscar Garcia. This entry was posted in News and tagged Asia, Canada, equity funds, Europe, fixed income, Latam, ranking, shares, USA on April 29, 2016 by Oscar Garcia. Model portfolio is one of the main fashion concepts in investments. They are mentioned everywhere and the roboadvisor trend has underlined them as a standard solution to offer easy and cheaper investment products with interesting returns. In T-Advisor, model portfolios are far from being something new. We saw it clear since the beginning three years ago. One of our modules is specific to provide two different kind of them: ETF portfolios divided in different risk profiles and share portfolios divided in different markets. Our modeling strategy is based on quantitative calculations. These are complex mathematical models that help detect investment opportunities mixing several indicators, as historical returns, volatility, trend, alpha, VaR, correlations… the data cocktail depends on the developer and the strategist, who work together to find the appropriate composition of this data mix in order to obtain the most interesting assets and the best performance. In our case, our model portfolios play with two criteria: best performance and capital preservation. We look for good returns to overperform the market, but we also reduce losses compared with the reference indexes in bearish periods. To keep these goals, we review every second month the model portfolios to rebalance the assets that are not working as we wish. Model portfolios are easy for customers: the structure is clear, they are based on a disciplined strategy and changes are seldom, in order to make adjustments in certain periods. However, they are not easy products for the companies that offer them, because they need strong calculation systems, as we have developed in T-Advisor. In addition, we cannot say that the machine work alone, but wealth managers monitor also the process, creating the strategy and analyzing possible changes. Although model portfolios are linked to roboadvisor, they are not totally robotic and they are used by traditional investment houses. Model portfolios are flexible, because the wealth manager can design them taking into account different diversification, risk, assets, currencies or geographical areas. They are also easy to explain to investors, because they look like bespoke boxes. 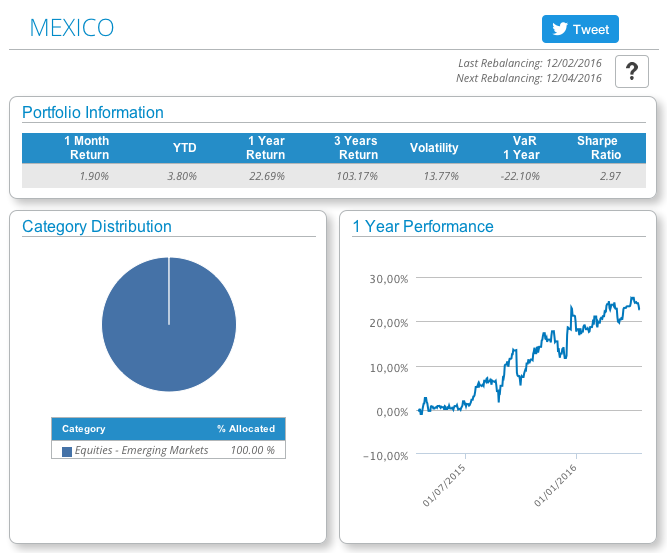 Take a look at one example in T-Advisor: our Mexico portfolio, composed by 10 local shares. The 1-year performance was 22.69%. The Mexican IPC index had a 1-year performance of… 0,46%. This is a clear example of how a model portfolio works. Individual investors choose them because they are easy to understand and wealth managers, because they are easy to explain. Communication plays a very important role in finance and easy products provide more trustworthiness. This entry was posted in T-Advisorpedia and tagged Capital preservation, ETF, investments, Model portfolios, Quantitative models, shares, wealth managers on April 14, 2016 by Oscar Garcia. This entry was posted in News and tagged Asia, Canada, equity funds, Europe, fixed income, Latam, ranking, shares, USA on March 31, 2016 by Oscar Garcia. PIONEER SF – EURO EXTRA LONG TERM BOND CLASS F NON. This entry was posted in News and tagged Asia, equity funds, Europe, fixed income, Investment funds, Latam, ranking, shares, USA on February 26, 2016 by Oscar Garcia. What stocks and funds were the best in January? T-Advisor publishes its ranking taking into account the score. T-Advisor patented score provides an asset rating (bullish, neutral or bearish) based on key performance indicators and technical analysis. This entry was posted in News and tagged Asia, equity funds, Europe, fixed income, funds, Latam, ranking, shares, USA on January 29, 2016 by Oscar Garcia. What stocks and funds were the best in December? T-Advisor publishes its ranking taking into account the score. T-Advisor patented score provides an asset rating (bullish, neutral or bearish) based on key performance indicators and technical analysis. This entry was posted in News and tagged Asia, Equities, Europe, fixed income, funds, Latam, shares, USA on December 18, 2015 by Oscar Garcia. This entry was posted in News and tagged Asia, equity funds, Europe, fixed income, funds, Latam, ranking, shares, USA on November 19, 2015 by Oscar Garcia. This entry was posted in News and tagged Asia, equity funds, Europe, fixed income, Investment funds, Latam, ranking, shares, USA on October 22, 2015 by Oscar Garcia.